We've been big fans of Borla Exhaust for BMWs since we opened our doors in 1993. Borla produces some of the best-sounding, lightest, longest lasting exhausts on the market. These systems are made in the USA with true T-304 stainless steel inside and out and backed with a 1,000,000 mile warranty. Borla puts and emphasis on quality by using stainless steel throughout their piping and muffler bodies (not a mild steel or coated aluminum). This ensures the muffler does not deteriorate from the inside out. Borla designs their exhausts to complement a BMW's understated sportiness, not overpower it. Borla produces each system to have a deep, sporty tone that doesn't offend or intrude on the cabin. So you hear the exhaust when you want to, not all the time. Most Borla BMW exhausts are a true-cat back and bolt or clamp to the original catalytic converter for an easy install. Each system is engineered for the application and refined in their own sound lab - changing pipe sizing, layout, and incorporating mufflers and/or resonators as needed to achieve a sporty yet refined sound. Borla also produces full race exhausts for the committed enthusiast with cat-delete and test pipes. Unleash the sound of the F10 M5's V8 with this Borla exhaust system! The V8 sounds so nice with this exhaust, you'll wonder why BMW didn't spec it like this from the beginning. If you've felt the sound is too quiet and distant this is the perfect M5 exhaust upgrade. The middle S-Spec exhaust not too loud, not too quiet. It's just right. Borla builds their exhaust with the goal of enhancing the sound - not just making it outrageously loud. In fact, Borla exhausts deliver some of the quietest and most pleasing sounds of all of the aftermarket brands we have seen. This Borla exhaust produces a deep rumble perfectly suited to the V8. It's a throaty sound that any American muscle car fan will appreciate. Yet it manages to be civilized and unobtrusive when needed. This system bolts on after the factory catalytic converters for an easy install. This system features a 3.0" pipe diameter leading into the mufflers (2.25" on exit) with 3.5" tips. Our most popular E36 exhaust system for over 15 years! We love the Borla on the E36 because the sound is a nice mixture of throaty growl and subdued volume. It's not too loud but still more than the stock exhaust. The tone is a deep burble that lets you know it's a touch more aggressive than a stock M3 exhaust. It's perfect for a daily-driver performance car that doesn't want to advertise too much. There are other exhausts that never seem quiet but this one that you won't ever tire of. Every Borla is made with 304 stainless steel for the internals and muffler body. Unlike other systems that can use coated aluminum, mild steel, or 409 stainless, the Borla uses true 304 stainless on the inside as well as the outside. This prevents the muffler from rusting and deteriorating from the inside out. Borla guarantees every muffler with a 1,000,000 mile warranty. 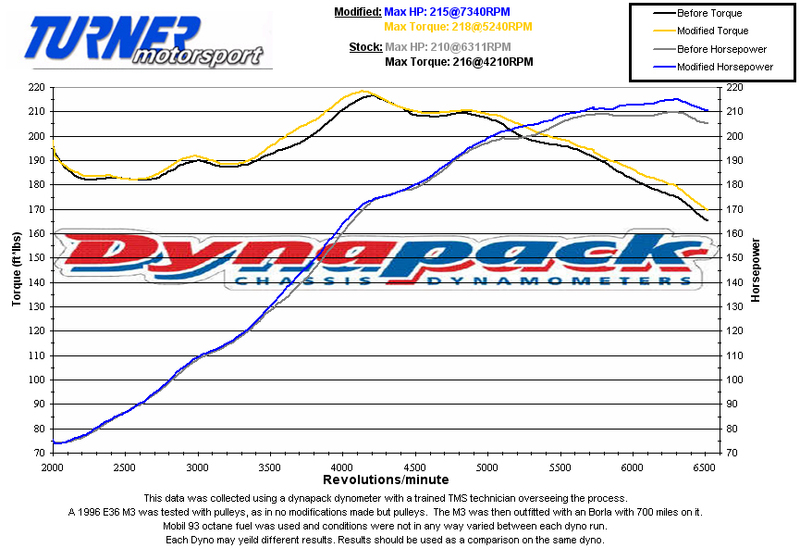 Click here for M3 Dyno Data. This stainless steel rear exhaust section replaces the heavy (and restrictive) stock exhaust system on the S55 engine. Shed excess weight and restriction, and get a better sound! You will love the rich, deep sound this tuned system gives your M3 or M4. There's a throaty and purposeful growl at low RPM and at cruise that highlights the six-cylinder engine under the hood. Unleash that M3's V8 burble with this Borla muffler system! The V8 M3 sounds sooo nice with this exhaust you'll wonder why BMW didn't spec it like this from the beginning. They didn't because they needed to make sure it was quiet enough for everyone. But if you have felt the sound is too quiet and distant this is the perfect M3 exhaust upgrade. Of the three systems that Borla makes, this is the middle spec. Borla builds their exhaust with the goal of enhancing the sound - not just making it outrageously loud. In fact, Borla exhausts are some of the quietest and most pleasing sounds of all of the aftermarket brands we have seen. The M3 Borla produces a deep rumble perfectly suited to the V8. It's a throaty sound that any American muscle car fan will appreciate. Yet it manages to be civilized and unobstrusive when needed. This system slips on after the factory resonator section for an easy install. The Borla mufflers and pipes weigh in at only 34lbs - almost half the weight of the stock system - which helps performance in all areas. The Borla 'Aggressive' system for the E90/E92 335i is a cat-back system comprised of no resonators, x-pipe section, and dual rear mufflers. This system was Borla's response to a demand for greater volume for the 335's twin-turbo N54 motor. The turbos make the car quieter so having a performance exhaust will allow you to finally hear the engine. Borla has tuned this exhaust to give more of a throaty burble, especially at low RPM while maintaining acceptable sound levels for daily street use. This Borla system is perfect if you want to hear the exhaust but not annoy the people in the car next to you. And this is a true cat-back system so no catalytic converters or emissions equipment is affecting by installing this. And with a free-flowing design this will allow a modest bump in power output. The Borla system is also a lot lighter than the factory system; less weight = more performance! This stainless steel rear exhaust section replaces the heavy (and restrictive) stock exhaust system on the F80 M3 or F80 M4 with S55 engine. Shed excess weight and restriction, and get a better sound! You will love the rich, deep sound this tuned system gives your M3 or M4. There's a throaty and purposeful growl at low RPM and at cruise that highlights the six-cylinder engine under the hood. And if you have tuned your BMW to make more boost than stock, you will greatly appreciate the Borla design without the restrictive resonator and muffler. This stainless steel rear exhaust section replaces the heavy (and restrictive) stock exhaust system on the F30 328i. Shed excess weight and restriction, and get a better sound! You will love the rich, deep sound this tuned system gives your 328i. There's a throaty and purposeful growl at low RPM and at cruise that makes you forget there's a four-cylinder under the hood. And if you have tuned your 328i to make more boost than stock, you will greatly appreciate the Borla design without the restrictive resonator and muffler. This stainless steel rear exhaust section replaces the heavy (and restrictive) stock exhaust system on the F32 435i. Shed excess weight and restriction, and get a better sound! You will love the rich, deep sound this tuned system gives your 435i. There's a throaty and purposeful growl at low RPM and at cruise that highlights the six-cylinder engine under the hood. And if you have tuned your 435i to make more boost than stock, you will greatly appreciate the Borla design without the restrictive resonator and muffler. These Borla mufflers will give your M3 a bit more growl and presence. These are stainless steel, high-flow mufflers that bolt on to the stock center section (or Borla midpipe). The stock M3 muffler is very large and softens the S54's exhaust note quite a bit. The Borla mufflers are much smaller and lighter with much-improved flow that increases horsepower and performance. Borla compared their mufflers with a common aftermarket brand and found their's flowed 10% better ( click here for Borla comparison ). The Borla system saves over 20lbs from the stock muffler. This stainless steel rear exhaust section replaces the heavy (and restrictive) stock exhaust system on the F30 335i F32 435i. Shed excess weight and restriction, and get a better sound! The ATAK system -- Acoustically Tuned Applied Kinetics -- allows a very high volume without drone and distortion. This is beyond the usual 'muscle car' sound - this is full blown automotive thunder! Borla manages the sound waves inside the exhaust to produce an exhaust note that maintains its tone as revs rise. With ATAK, the sound output is tuned like a graphic equalizer to shape and focus sound waves for optimum high-volume output. This exclusive technology produces the highest available dB (decibel) levels in the Borla street-legal lineup, and is designed for high-performance purists who prefer exhaust notes over their stereos. And if you have tuned your 335i to make more boost than stock, you will greatly appreciate the Borla design without the restrictive resonator and muffler. These Borla Test Pipes replace the secondary cats on the E9X 335i/335xi with the N54 engine. These are perfect for setting up your own custom exhaust as they bolt on to the stock downpipes with factory-style flanges. At the back of this section is an open pipe that can be used with the Borla cat-back mufflers or with another system of your own design (these are not designed to work with the stock exhaust system). Eliminating any part of the stock emissions equipment means this piece is for off road use only . The secondary cats are a small area of restriction on these cars, so for a track-only car removing the catalytic converter is a must. Deleting the secondary cats not only frees up horsepower but also removes a potential blockage if the cat material were to break down. And since racecars don't need catalytic converters anyway the stock cats are simply unnecessary weight. These also work great when used with the Borla 'Aggressive' cat-back exhaust for a huge weight savings and great sound. This part alters or deletes the emissions equipment on your car. Because of this, we require a waiver of emissions compliance to be signed and sent in to TMS. You can download the waiver here.